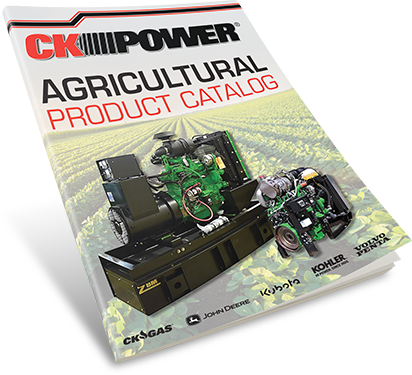 CK Power is a full-service supplier of final Tier 4 power units for the agriculture market. With implementation deadlines for all non-road applications having come and gone, we’re working with agriculture businesses to make this transition as smooth and seamless as possible. For pumping, irrigation and earth moving equipment of all types, CK Power is the Ag market’s source for the power solutions that drive them. More than just an engine supplier, we can advise on the best way for your operation to comply with these new EPA emission standards without breaking the bank or forcing serious modifications of your existing business practices. For information on ranging from background on the new rules, which applications are affected and which strategies will best help you to comply, we aim to be your resource for adapting. In addition to offering new diesel engines compliant with final Tier 4 emission standards from John Deere, Volvo Penta, Kubota and Kohler engines, CK Power is also capable of repowering existing engines to keep your engine investments in the game and working hard. Finally, CK Gas also offers a complete line of natural gas and propane engines. These gaseous engines can be used as an alternative to, or in conjunction with, electric and diesel solutions. So if you’re in need of prime power solutions for the agriculture market, or advising on the best ways to comply with final Tier 4 standards, whether that means repowering existing equipment, investing in new equipment, or embracing a natural gas option, CK Power is here and ready to talk. Get in touch with us today.